I don’t think I’ve blown through any series of books the way I devoured all four volumes of Elena Ferrante’s Neapolitan Novels. After hearing some of the acclaim, I casually signed up for the New York Public Library waitlist for Book 1. I finished the book in a week and, unable to deal with another months-long waitlist, I immediately went charging for the nearest Barnes and Noble for Book 2. And then the same thing happened with Book 3, and Book 4, and then I went ahead and bought Book 1 anyway. I would barely budge from my bed all weekend, starting in the morning and reading until past midnight. There is too much to say about these books in a single blogpost, but the narrator Lenù is so introspective it’s alarming. At any given sentence I could feel embarrassed, enthralled and envious (for not having written it myself). The novels were overall the single richest depiction of a friendship I’ve ever read, especially female friendship, and as someone who has maintained several close friends from my childhood I could relate to it. Genuine friendship, as Ferrante demonstrates, is more than just happy bonding; it’s also punctuated by periods of jealousy, frustration, and resentment that nevertheless lead to a more profound relationship. I felt so immersed in the world of post-war Italy while reading these books that I was inspired to incorporate some of the fashion of my own life. Clothes are intrinsically linked to the Lenù and Lila’s ideas of a better life as they try to escape the poverty they were born into, as well as their diverging paths to that success. A case in point is their wedding outfits: Lila, with the elaborate white dress, follows the traditional route by marrying into one of the most affluent families in their Naples neighborhood; Lenù, with her short skirt-suit, represents the modern woman, seeking social mobility through education. I’ve included a few scenes I was compelled to replicate. Meanwhile I’m hoping they’ll hire me as a fashion consultant to the television adaptation that’s supposedly in the works. All quotes are from the Europa Editions translations. When Lila becomes engaged to Stefano, the son of the grocer, she decides to leave her impoverished past behind and mold herself into a true lady. Her expensive outfits and trips to the hairdresser incite scorn and jealousy in Lenù and her friends, complaining that Lila and Stefano are always swathing around like “John and Jacqueline Kennedy” or “the Shah and Princess Soraya.” Lenù is bitter because the situation forces her to wonder if Lila achieving greater success, despite the fact that Lenù is the one pursuing her studies. Lenù is accepted to study at Scuola Normale Superiore di Pisa (“The Normale”), a considerable feat for a poor woman at the time. As she hopes to leave the petty drama of Naples behind her, she begins to live a more sophisticated life, traveling Europe and frequenting intellectual circles. Much of this comes at the patronage of her new boyfriend Franco Mari, “a rather ugly but amusing boy,” who provides her with stylish clothes and, ironically, Trotskyite sympathies. 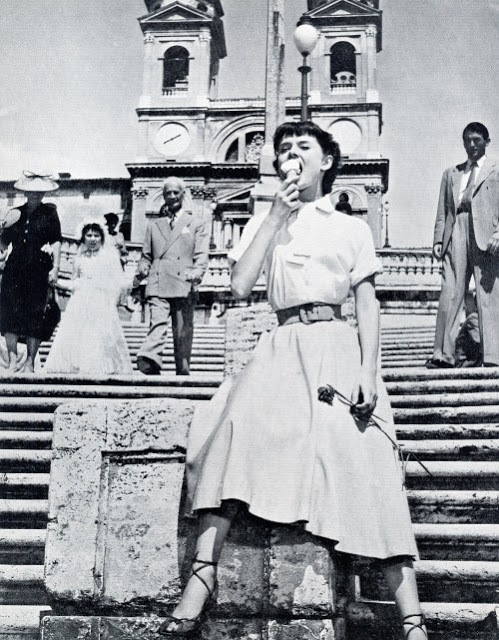 This look was also inspired by Roman Holiday and The Talented Mr. Ripley. Yet Lenù can never truly leave the neighborhood, or Lila, behind. During one visit home after Lila’s marriage, she discovers that her friend’s fairytale wedding gave way to a nightmare. Hoping to spite her husband, she decides to dress ostentatiously and pay a visit to the detested Solara brothers, who are both transfixed by her. Lenù for her part is embarrassed to be seen with her. For the record, walking around the gray streets of my own New York City neighborhood like this was pretty strange as well.